Let's remember what bets we have in the casino. Yeah, first division is inside and outside bets. This strategy covers the inside bets, which is not very common for the betting systems at all as in most cases they lead to losses, not to winning which are so wanted in gambling. Yes, we are still talking about the bets, not directions in the streets. It is another variation of the "suppose, I can win" strategy. It includes betting on two double streets, quad bet and a straight up number. If we count, we see that these bets cover 17 numbers, which is almost a half of European or American roulette. As we are wagering on double street, which covers 6 numbers, our payout will be 5/1. The corner bet payout is 8/1, and the straight up is the most attractive, because it is 35/1. The experts of this betting strategy assume that it is better to make a straight up bet on a separate number, not included in other bets. It raises your chances to win. 1 chip with 35/1 payout = 35 chips - 5 lost chips. First you will have to make six bets: five corner/quad bets and one straight up bet. The thing is that you choose what corners you bet on and the same is with the straight up bet. So, after betting, you see that 21 numbers are covered, which is pretty impressive. But if your straight up bet is in one of the corner bets, correspondently, you cover 20 numbers. Let's assume that one of the quad bets won. You win 8 chips according to the payout table. But you lose other 5 chips, betted on other spots. It means that your total profit is 3 chips. But there is also a possibility that you can win a straight up bet. 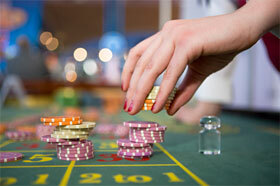 In this case your profit will be 30 chips, as other 5 bets would lose. These strategies are not designed for large winning but for small sums of cash. Also you are winning really slow but having good time and extending your time at the table.